The Burma political situation began to disturb me. True, the country had a democratic civilian form of government, however, the real power broker was the former postal sorter, General Ne Win who controlled not only the army but also each branch of the armed forces. The General vetted all decisions taken by the civilian government, and as the months passed his contempt for the government became increasingly obvious. It seemed to me that the General would grasp control sooner rather than later! I discussed my fears with several influential Masonic colleagues who assured me that in this glorious land of waving palms, golden pagodas and happy folk, nothing of the sort could happen. This put my mind at ease for, such astute people could not be wrong. However, significant event followed significant event and my fears returned. One morning I found Captain Pat Moore, then Cathay Pacific’s Operations Manager, drinking coffee in Moutrie’s Palace of Germs. Parked on the tarmac was a Cathay DC-4 looking so big and beautiful, and his offer of a job was accepted with indecent haste. In June 1953 I returned to the Cathay fold, and there I stayed. My native cunning proved of more value than that of my influential advisers. True, it took longer than I visualised, but when it happened I was established in Cathay. On the morning of 2 March 1962 a young Karen nurse heard a rumble that increased to a roar. She hurried out of the cool interior of the Prome Road Nursing Home on Kokine Lakes. Her Matron, Sister Heather Ba Than put a comforting arm around her young nurse. In tears, they watched tank after tank thundering the final 5 ½ miles to a coup d’etat. By nightfall the country was under the autocratic control of General Ne Win. From that moment the country gradually slipped into oblivion, however the final straw would not occur until 19 March 1964. On that day the General showed his contempt by nationalising all foreign owned commercial businesses and stores. A few minutes after noon a convoy of army trucks moved into the city. They discharged small groups of men who swaggered into surrounding commercial houses, shops and stores. These men took control of the doors and prevented anyone from leaving. Meanwhile, all telephone communication was suspended. Capt. 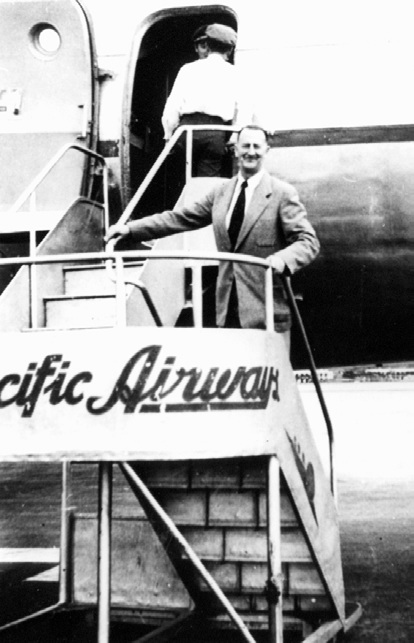 Pat Moore climbs aboard Cathay's flag-ship DC-4 VR-HEU. A short time later a senior officer entered the first firm on his list. This was the giant pharmaceutical firm E.M. de Souza, established by my friend, the late Dr. Lance Rutherford. The officer announced the firm was nationalised. His men erected a green signboard that bore the Burmese words; People’s Shop Number 9999, property of the State. They then rounded up all the people within the premises, identified them, and had them turn out their pockets. Then they were searched, their possessions were labelled. As they were bundled out the door each received the ultimate insult - a receipt. The imposing Masonic building got personal attention from the General. He had his men toss out all the furnishings and workers. This became his War Office. I am unsure of the number he allotted this building but the size of the de Souza number seemed to indicate they expected to be busy for this day the nationalisation of foreign properties was synchronised throughout the entire country. The palms continued to wave, the pagodas glowed golden, but the people smiled no more.